It supports young string players in Norfolk by assisting with the cost of lessons, purchase of instruments and financial help to attend courses and workshops. Working in the community, the Trust has also run workshops and events benefiting many hundreds of violinists, violists, cellists and double basses of varying standards which are promoted twice a year. The Trust also has a number of valuable string instruments for loan. In 2007, the Trust took over running the Norfolk Young Musician Competition. Robert Michael Badminton, who liked to be known as Mike, was born in Derby in 1935, educated in Ripley and qualified in medicine from Birmingham University. Mike worked initially as a General Practitioner in Norwich, before moving to Public Health Medicine in Norwich from 1982-1994. Apart from a busy career, his other great passion and interest was music. As a young violinist he played in the National Youth Orchestra of Great Britain and was leader of the Midlands Youth Orchestra. He led the Norwich Mozart Orchestra for 27 years and was also principal viola in the Academy of St Thomas and orchestra chairman. 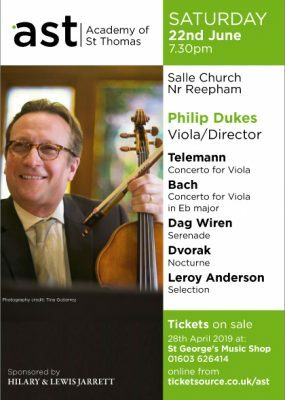 Mike also taught violin and viola for some 30 years, and several pupils became members of the National Youth Orchestra of Great Britain, including Alan Brind who went on to win the BBC Young Musician of the Year Competition String Section. On retirement from Public Health Medicine in 1994, he increased his involvement in music, teaching and providing performing opportunities for young musicians. He was also a mentor to many young people from different walks of life. In 1998 he established the Michael Badminton Young Musicians Trust with the aim of helping young musicians by providing financial support. Mike passed away in August 1999, aged 63 leaving the work of the Trust to Chairman, Jonathan Wortley, cellist Martin Storey, and his nephew Dr Mike Badminton assisted by Sally Wortley. He chose Salle Church as his final resting place. Thomas Isaac a young cellist from Norwich is just one of those to have been helped by the Trust. In recognition of the Trust’s work, a benefit Cello Recital generously offered by the internationally renowned cellist Alexander Baillie will take place at the John Innes Centre at 3pm on Sunday 14th January.